Tá difríochtaí beaga ann idir na Sé Chontae agus Poblacht na hÉireann. Tá ceann acu faoi réimeas de Varad, ceann eile faoi réimeas Bhanríon Shasana (nó mar a deir meáin na 26 Chontae, ‘An Bhanríon’). Tá ceann amháin mar dhlúthcuid den Aontas Eorpach, ceann eile le himeacht ón AE, seans. Ach tá difear eile níos suntasaí ná sin eatarthu fiú… brioscáin phrátaí! Sea a chairde Gael, an cheist atá ag scoilteadh dearthár ó dheartháir agus deirféar ó dheirfiúr ó bhí na 1950í ann: cé acu is fearr, ‘Freestate Tayto’ nó ‘Nordie Tayto’? 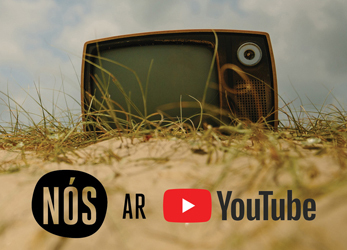 Tá an bheirt acu tábhachtach ó thuaidh is ó dheas – tá Tayto an deiscirt chomh tábhachtach sin go bhfuil an focal ‘Tayto’ á úsáid do gach cineál brioscáin phrátaí i nGaeilge agus i mBéarla fiú. Ach cén fáth a bhfuil difear eatarthu sa chéad dul síos? Aisteach go leor, níl aon nasc idir an dá chomhlacht seo inniu agus ba bheag an ceangal eatarthu riamh, d’ainneoin go n-úsáideann an bheirt acu ‘Mr Tayto’ mar íomhá mhargaíochta. Ba iad Tayto na Poblachta an chéad dream acu ar an saol. Bhunaigh Joe ‘Spud’ Murphy an comhlacht in 1954 in dhá sheomra ar cíos ar Shráid an Mhúraigh i mBaile Átha Cliath. Thosaigh sé amach go beag bídeach – ní raibh ann ach Joe, ochtar d’fhostaithe agus veáin. Ní raibh de phraghas orthu ag am sin ach ceithre pingine! Ba é Joe ‘Spud’ Murphy an fear a chruthaigh an blas ‘Cáis agus Oinniún’ a bhfuil clú agus cáil air go dtí an lá atá inniu ann, agus cé go bhfuil go leor blasanna eile ar fáil, tá muid ag caint ar ‘Cáis agus Oinniún’ san alt seo gan dabht. Thosaigh Tayto sa tuaisceart dhá bhliana ina dhiaidh sin, sa bhliain 1956. Fear darbh ainm Thomas Hutchinson a bhunaigh an comhlacht agus shocraigh sé ainm ‘Tayto’ agus oidis Tayto an deiscirt a úsáid faoi cheadúnas – cé go maitear ar shuíomh Nordie Tayto gur smaoineamh s’aigesean a bhí ann! Sin an fáth a bhfuil an t-ainm céanna orthu go dtí an lá atá inniu ann. Tá baint nach beag idir Tayto an tuaiscirt agus na sean-uaisle Gaelacha, Clann Uí Anluain. Déantar brioscáin an tuaiscirt in ‘Tayto Castle’ taobh amuigh de Thóin Ré Gaoith i gContae Ard Mhacha, atá breis agus 500 bliain d’aois agus a bhí ina dhaingean ag Clann Uí Anluain go dtí gur goideadh uatha é in 1619. Ar ndóigh, cé go bhfuil an chuma ar an scéal go bhfuil Tayto ‘Cáis agus Oinniún’ an tuaiscirt bunaithe ar oideas an deiscirt, tá an dá bhlas go measartha difriúil óna chéile inniu. Ach cé acu is fearr? Bhuel, tchítear domsa go mbraitheann sé sin ar cibé áit inár tógadh an blastóir féin! 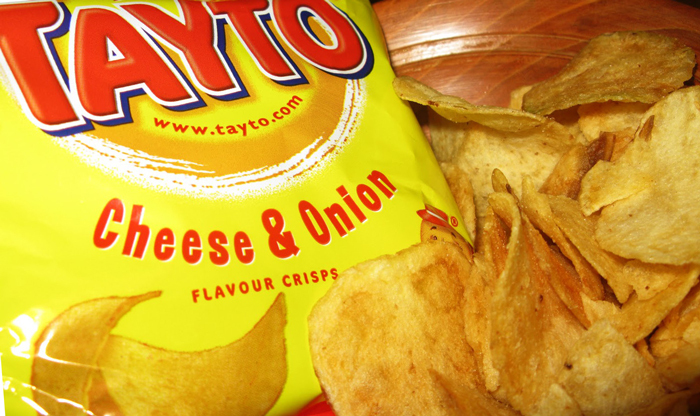 Tá sé de nós ag tuaisceartaigh ‘Nordie Tayto’ a roghnú thar ‘Freestate Tayto’ agus, ní nach ionadh, vice versa. Dar ndóigh, tá pacáistiú Gaeilge eisithe ag Tayto an deiscirt le linn Sheachtain na Gaeilge roimhe seo – rud a thaitin linn go léir mar Ghaeilgeoirí – ach ní ceart ligean dó sin cur isteach ar ár gcumas breithiúnais anseo… caithfidh muid a bheith eolaíoch! 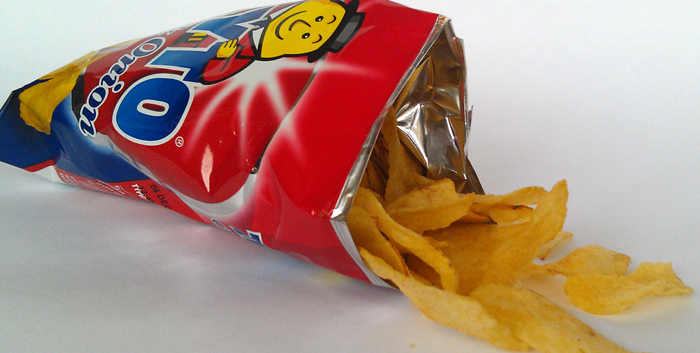 Dar liomsa, tá blas níos láidre ag Tayto an tuaiscirt, seans go mbeadh sé ró-láidir do roinnt daoine. Tá siad géar, garbh, trodach agus más maith leat, tuaisceartach! Tá rud éigin níos séimhe, níos suaimhní, níos fínealta faoi Tayto an deisceart, níl an blas chomh láidir céanna. Ní thugann siad an dúshlán céanna duit. Tá siad níos, bhuel, deisceartaí! Ach ní drochrud é sin, is dócha go bhfuil siad níos deise mar bhrioscáin – sin mar bhrioscáin iontu féin, leo féin. Mar sin dá mbeadh orm paicéad brioscán a ithe leo féin roghnóinn ‘Freestate Tayto’. Ach cad is fiú brioscáin a ithe leo féin? Is fearr liomsa brioscáin, agus go háirithe brioscáin ‘Cáis agus Oinniún’, a ithe i gceapaire, butaithe a dhéanamh astu mar a déarfá. Agus más butaí atá i gceist againn, níl aon rogha eile ann… tá blas láidir ‘Nordie Tayto’ de dhíth. Sin é mo thaighde, má tá bréag ann bíodh, ní mise a chum ach is mise a d’ith! Foilsíodh leagan den alt seo in eagrán 37 d’iris chlóite NÓS.